H4 Work Authorization, Work Permit or H4 EAD and H4 Visa Issues: H4 EAD Lawsuit - Will the Preliminary Injunction Succeed? 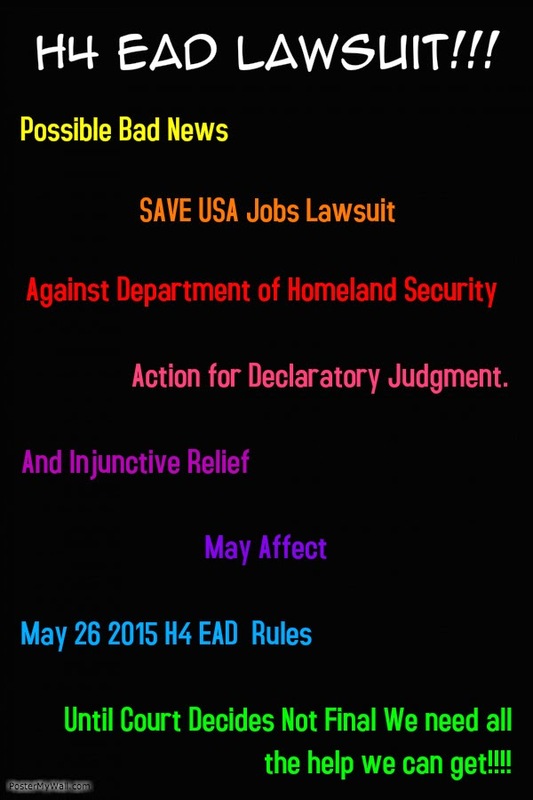 H4 EAD Lawsuit - Will the Preliminary Injunction Succeed? That the grant of an injunction would serve the public interest. The "balance of harms" refers to the threatened injury to the party seeking the preliminary injunction as compared to the harm that the other party may suffer from the injunction. The real question is whether members of Save Jobs USA will actually suffer irreparable damage or injury if some of the H4 visa holders obtain a work permit (EAD). Well, since Save Jobs USA is a group of mostly engineers, in order for them to actually suffer "irreparable harm" all the H4 Visa holders would have to be engineers. Since most probably are not, it might be hard to prove that they will be taking their jobs. As for the other elements, we will leave it to the government to disprove that there is no available remedy and that injunction will actually be serving public interest. From an economic perspective, we need to remember that we are living in a capitalist society, and competition is normal. If everybody would sue because they feel someone is competing with them, it will be chaos. The same arguments have been used against NAFTA and other trade trade agreements, and have failed. In fact, such agreements have made the USA stronger. The H4 EAD is a drop of water in a big ocean of injustice caused by the delay for many to obtain their permanent residence. It would be unfair and unjustifiable for the judge to decide that this law should be stopped. We need to let the H4 visa holders have a chance. In fact, having worked with hundreds of H4 visa holders, we have witness their amazing potential and determination. The truth is that if one third of the H4 EAD holders open a business and employ three employees each, it might actually create more jobs for Americans. Through the economic multiplier effect, it will also create more wealth. Therefore in the spirit of justice and public interest, we have good grounds to fight this injunction and ask the judge that allowing such an injunction will go against all American values. Labels: feedback on h4 lawsuit.